Stein's Taphouse are holding an exclusive event on the Queen's Birthday Weekend from Friday 9 June - Monday 12 June where 4 local breweries will be 'taking over' their beer taps. To give you some insight about the breweries that will be taking part in this event, we will be sharing some background about them and their beers that will be on offer over the weekend. 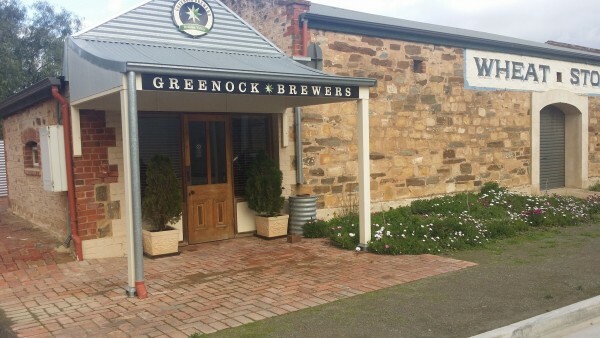 Greenock Brewers is a boutique brewery situated in the picturesque village of Greenock on the Western ridge of the Barossa Valley. Husband and wife team Chris and Lisa Higgins produce artisan beer in an historic 100 year old wheat store turned micro-brewery in 2005. "Our beers are made using only the finest ingredients adhering to the German Purity Law of 1516- "Reinheitsgebot"- no preservatives or additives. We concentrate on producing session beers that are full of flavour and character but that remain easy to drink when you feel like having a few!" "Owning a micro-brewery is Chris' dream job having started home brewing 25 years ago and maintaining a strong love of drinking beer over the years. There are plans for expanding production to include smaller batches of seasonal beers and renovations to the attached villa as a B&B." Chris and Lisa love meeting people from all over the world in the cellar door located at The Wheat Store, Mill Street Greenock, South Australia. Open Fridays, Saturdays and Sundays 11am to 7pm and also by appointment. The three beers that will be on offer at the Stein's Taphouse Beer Tap Take-Over will be the Bunawunda Blonde, the Victorville Ale and the Greenock Dark Ale. Below are some more details about their beers. Greenock Brewers brew their German Blonde as a lager (cold with bottom fermenting yeast) using Australian pils and specialty German malts. They use the Noble Czech Aroma Hop Saaz. This is blonde! Nothing to do with carbs. A crisp malt body is balanced with clean bitterness and mild spiciness - 4.7%. Big on its hop aromas and has moderate bitterness. They use cascade and armarillo hops with cascades late in the boil and also dry hopping in the fermenter. Victorville has a citrus flavour profile with pronounced grapefruit and a touch of passionfruit. A perfect cleanser after that big heavy red or heavy real ale. Victorville is a true session beer - 4.9%. A full bodied English porter style ale. Greenock Brewers use generous amounts of drum-roasted barley malt and chocolate malt. These produce the coffee and chocolate characters that balance with mocha and smokey aromas that are not too dominant in the flavour. Nottingham Ale Yeast is used to retain the true English style. Pride of Ringwood Hops are used for mild bittering and subtle aromas. These hops can be described as having a spicy kick with essence of citrus and fruit-like tones, making for a strong yet delectable aroma and flavour. A great autumn and winter beer - 4.7%.